The exhibition Over There brings together the work of Colin Matthes and Brandon Bauer, two artists engaged in dealing with topical subjects in their respective bodies of work for over a decade. The work on display comes from Colin Matthes’ ongoing series Everyday Transactions, and Brandon Bauer’s Soldier series. The exhibition also features a series of collaborative paintings and drawings, as well as a collaborative installation that highlights the intersecting concerns of these two artists. In the work of both artists, one can see an honest search for understanding of the mechanisms that drive war, a voice challenging American aggression, and sympathy for all those affected by conflict. The work often presents more questions than conclusions and in contemplating the work a rich and layered interpretation unfolds. These artists seek to see the whole situation and ultimately to find a new way forward. 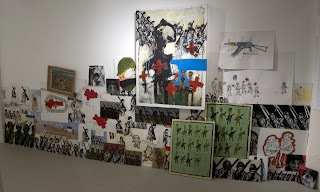 A common motif in both artists work is the soldier, depicted at once as a fortified mass, as protector, as a vulnerable human being, and as a disposable resource. In Colin’s work, one sees an artist striving to understand the mechanisms of American hegemony often creating paradoxical scenarios that include business transactions, leisure activities, and elements of warfare. The work asks questions about humanity and our relationships in this globalized world. 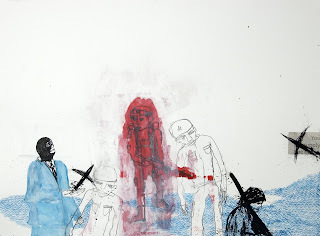 Brandon’s Soldier series shows a deep empathy for soldiers fighting and dying from an unseen enemy in an unpopular war. The works on display by both artists present two sides of the same coin. These works question the cost of war, as well as its effect. This exhibition also features a collaborative video installation by Brandon Bauer and the experimental noise musician Peter J. Woods entitled Hungry Ghosts. With seductive imagery culled from mediated sources and manipulated to the point of near abstraction, the work expresses despair, frustration, and anger at the war in Iraq, and illuminates the cycles of violence that warfare and occupation breeds. For more information, please contact the Brooks Barrow gallery at 414.331.8635. A DVD of the Collaborative Video Hungry Ghosts is available through the gallery. Link to the Critical Juncture Blogpost.